Now that colder weather has arrived and preservation projects at our historic properties have slowed down, Historic New England’s carpentry crew is focused on shop work and planning for next year’s projects. This time of year allows a chance to reflect on the work accomplished during the recent building season. This is the third in a series of posts detailing recent carpentry projects that are essential in preserving Historic New England’s properties. One of the more vulnerable features of an older home is a wooden bulkhead door. Lying at a shallow angle, a bulkhead must shed water like a roof while also functioning as a door. Maintaining, repairing, and ultimately replacing bulkhead doors is part of the routine maintenance required in a traditional home. 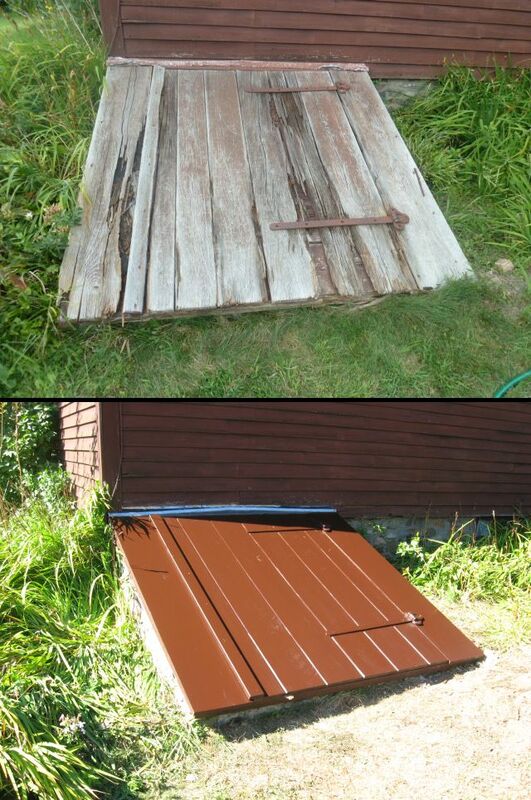 In the fall of 2012, Dole-Little House in Newbury, Massachusetts, received a completely new bulkhead door and frame. The door and the frame components were built in Historic New England’s carpentry shop at the Lyman Estate in Waltham, Massachusetts, and assembled at Dole-Little House over two days in late September. The original hinges were given a new coat of paint and reused. While bulkheads don’t have the allure of carved ornament or hand-hewn timber frames, they are part of the historic fabric and working systems of our buildings, providing weather protection and access for the staff, tenants, and contractors who keep these irreplaceable artifacts of New England’s built environment sound and functional. Please consider supporting this important work with a donation to our Preservation Maintenance Fund.